For most of this route the navigation is very easy. From Lewes take a train towards London and change at Haywards heath. Journey time is about 39 minutes. 1). Come out of the station. Turn right, Walk under the railway. Take the first right. Walk for about 400 metres down this dreary road. Don’t worry- things get much better soon. Cross the road when convenient and continue in the same direction. Come to a footpath sign pointing to the left, but keep on the pavement. Shortly afterwards come to a sign directing you to the Worth Way cycleway. Turn left along the way. Cross over a bridge. Keep straight ahead, but at the next footpath junction take the path to the right, signposted to Maidenbower. At the end of this footpath you emerge at a road. Turn left along the pavement and walk towards a roundabout. You will see a crossing just to the left of the roundabout. Cross the road here. You will see a small road ahead, with a footpath sign. Walk up this and, as it bears right, take the footpath to the right which is fenced off from the road. The path turns left and passes between trees and gardens. It emerges at a road. Opposite, slightly to the right, you will see a lane to Worth Church. Take this. After a few metres you come to a seat on your left and, just after this, a tarmac track bearing left. Take this. You are now on the Worth Way again. The navigation is now fairly obvious. You cross a motorway bridge, turn left and right and then keep straight ahead at any junctions. At one point there is what looks like a Y junction. Take the right fork, signposted for the cycleway. You are now entering Worthlodge Forest. This is a privately owned wood, so you are not allowed to leave the track, which is called Standinghall Lane. You can see horse chestnuts, oak, ash and pine. There are lots of bluebells in spring and all sorts of fungi in autumn. Keep an eye out for animals too. Continue straight ahead at any junctions till you emerge at the road near Worth Abbey School. Turn right here and walk along the verge for about 300 metres (the verge on the opposite side of the road is generally wider). After 300 metres follow a tarmac drive to the right, with bridleway sign. This is a right of way so you can ignore the private sign on the left. Continue straight ahead to come out at a main road. Cross this carefully and go through the gate straight ahead. There is now a further locked gate in front of you, but you will see a bridleway sign and a path bearing off to the left. Take this. The route is now obvious and there are fences (often ruined) on either side of you. This is Worth Forest, perhaps the most attractive part of the wood. As you approach the railway the path dips and can be a rather muddy, although there is raised planking to the right and, after it ends, you can still avoid the muddy bits. Cross the railway. The track bears right and uphill. 3). About 50 metres after crossing the railway there is a metal gate across a track on the right, with a cycle gate on the right. Go through the cycle gate and keep straight ahead on a clear sandy track. 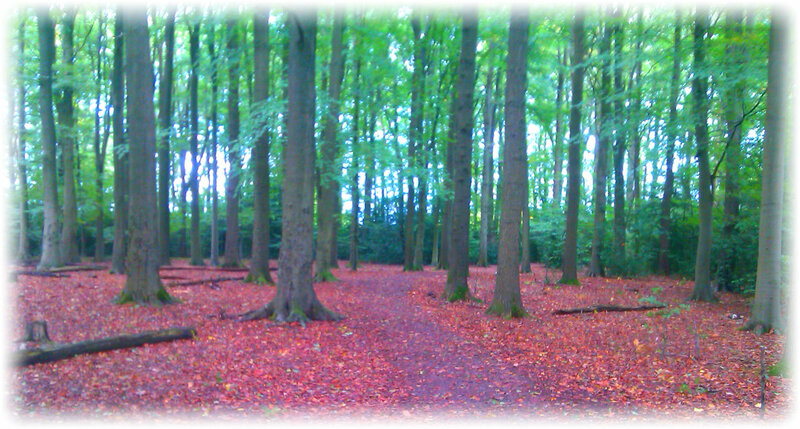 You are now in Tilgate Forest. 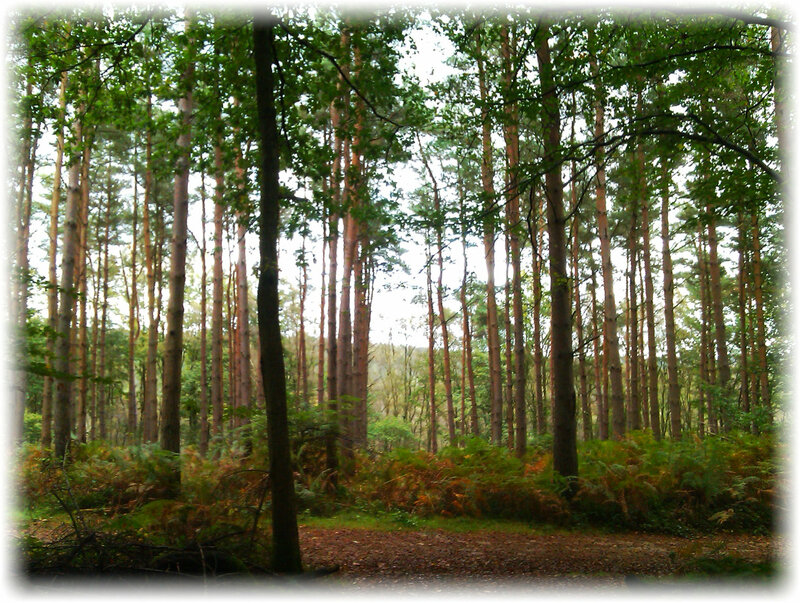 This is open access land managed by the Forestry Commission, so you can wander about at will. The main route, however continues ahead. There can be one or two muddy bits here, but you can skirt round them. Come to a bridge across the motorway and cross it. 4). After the motorway bridge take the path to the right, signposted as the cycle route. The path goes through Tilgate Forest Golf Course, but is wrapped about by trees, so you get little sense of being on a golf course. Continue to follow the path through the trees. Eventually you come to a junction. The main path keeps straight ahead, but you take the right fork, signposted as the cycleway. Shortly, the path turns left and emerges in an estate of modern houses. Walk straight ahead down the estate road to the point where it turns sharply left. 5). Turn right here along a footpath and cycle route which passes under the railway. After the railway keep straight ahead on the route, which runs next to an estate road. At a roundabout keep straight ahead. About 50 metres after the roundabout take a path to the left (also a cycle route) Follow this through trees across a number of streets. At a fork bear right and then pass a path off to the left. Continue to follow the cycleway signs. Cross a bridge over a stream. The path then turns right and then left. The path now goes under a bridge. This is the bridge that you crossed at the start of the walk. Right after the bridge there are steps to the left. Go up these and then turn right. You are now on your outward route. Return the way you came. “Heavily-afforested, dissected plateau landscape enclosing a post-medieval rural landscape cut from the forest. Densely wooded, confined, dissected plateau landscape with extensive coniferous and mixed afforestation. 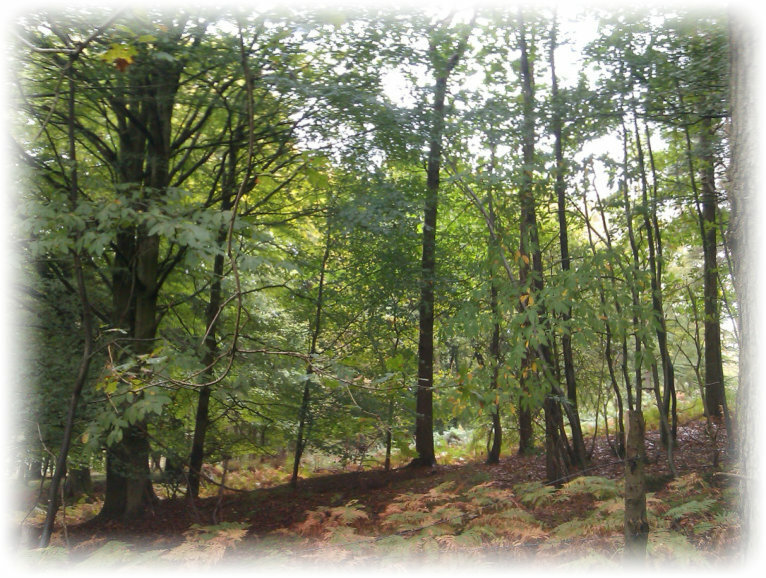 The Worth forests mark the plateau-like western end of the High Weald Forest Ridge, drained by the Rivers Mole and Ouse. Long views over the Low Weald to the downs but fewer long views north. Large, regularly-enclosed and some smaller, irregular, assart fields within a woodland setting comprising an arable and pastoral landscape enclosed by shaws, hedgerows and fencing. A catholic monastery and school. There are various possibilities for visiting the monastery. 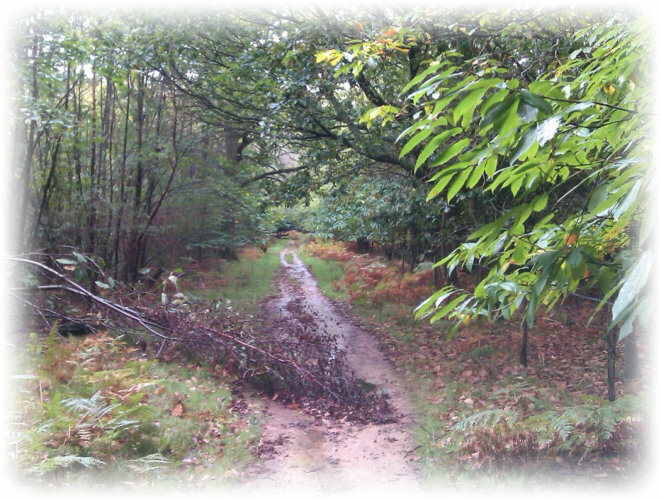 According to the High Weald board You can walk, ride or cycle the many trails around the forest. Search for a variety of wildlife including deer (fallow and roe), grass snakes and adders, dormice, solitary bees and wood ants..On sunny summer days basking grass snakes and adders and common lizards. A variety of woodland and heathland birds. You can hear deer rutting in the woods in the autumn. Nightjars churring on warm summer evenings. This is land to which the public has access and you can see the contrast with the land you have walked through before, particularly as you get near to Three Bridges. 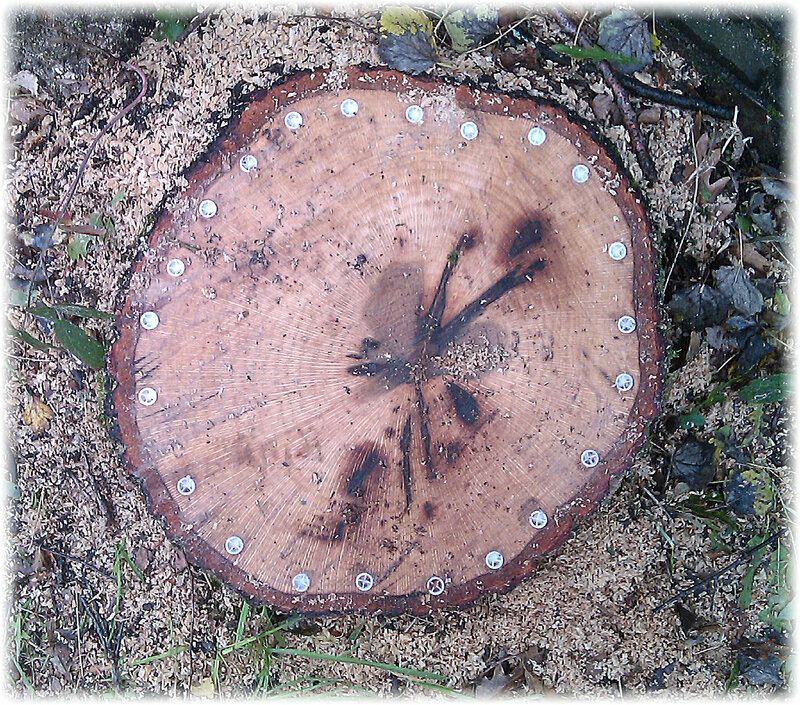 While researching the walk a number of children rushed up to show me what they had found while having “forest school”.